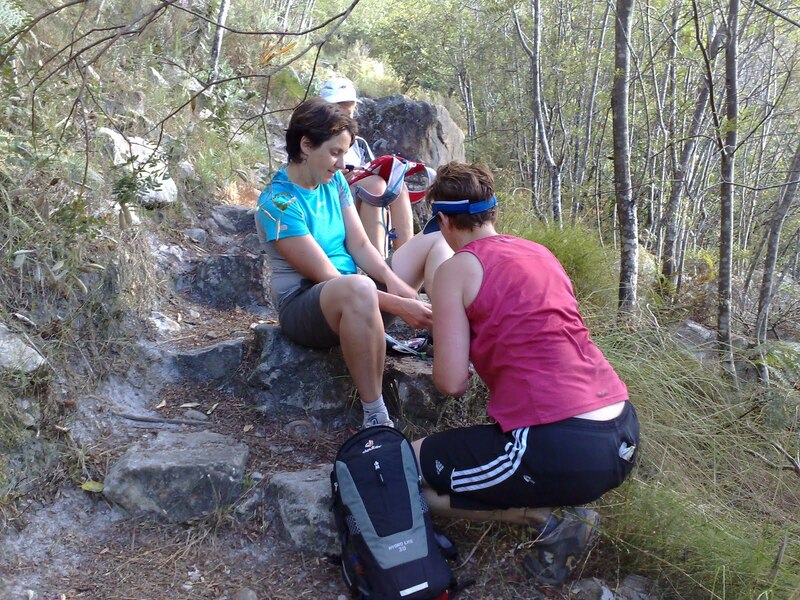 A flatish run with lots of opportunity to stretch out the legs. 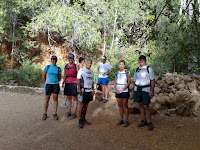 A reasonable group gathered for our 21st trail run. 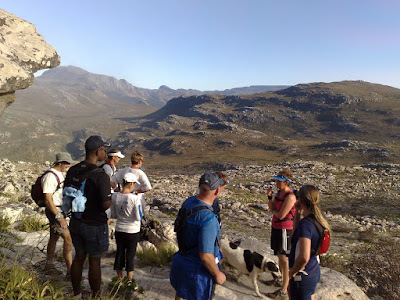 I languished at the back while Gaeleen set the pace up front so I can't report much about the day except that as usual the company was great, the route fun and a pleasant time was had by most. Roumor has it that two spectacular tumbles resulted in a tie for the Jungle Joe award this week. Unfortunatly the one contestant escaped before providing me with a photo-op but I did manage to catch Gaeleen's efforts and she will be entered into the "hall of shame" - well done Gaeleen. 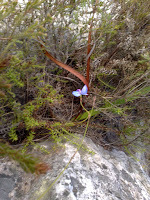 Fay did her bit and diverted us up a dry river bed to see some of the last few disa's in bloom. 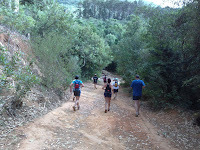 We had a good,varied and enthusiastic turn out for Saturday’s recce run over the 2 Oceans trail route with several newcomers, and members of Tim’s trail running groups joining in. 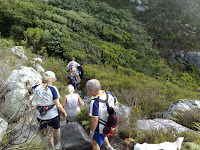 With the help from many we did actually manage to run over much of the route as best we could tell from the somewhat vague map published on the Two Oceans web site. However having subsequently checked my GPS track with the map I believe we made two mistakes following on the first one when we turned back downhill, firstly we turned down off the Woodcutters Trail too soon and secondly we ran down the tarred road towards the gate when we should have been running through the wooded area about 200m to our right. Anyway the aim of the exercise was to get to know the route so next time we will start with a far better idea of the route to follow. Due to our navigational errors we ran short only covering 8Kms in 1hr 24 mins So we can make it up next week!!! Other than that no problems everyone stayed on their feet. This week we had a very good turn out with 15 runners and 2 in Fay’s walking group. over looking St James. 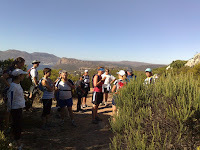 Here another regroup and view over False Bay. 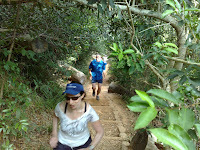 From there it was an fairly easy run/walk to Nellie’s Pool and over to Junction pool and a sidestep to the right, up and over the “short cut’ path to meet up with the gravel track past the waterfall and an undulating cruise back to the car park. No accidents, gentle breeze and almost no mist on the ridge, all in all a very good outing covering 10.5 Km with a running time of just over 2 hrs. Saturday's outing starting from the foot of Platterklip Gorge was almost a sequel to last year's "Gorillas in the Mist" because as we reached the saddle between Devil's Peak and the eastern face of Table Mountain a thick mist suddenly rolled in on us reducing visibility to about 10m. 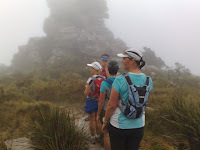 Anyway the six of us found our way to the top of Newlands Ravine, the mist cleared and we had bright sunlight for the descen and the rest of the run. On the way down Elaine stumbled and sprained her ankle but after quickly strapping it up she was off like a gazelle and continued in fine style down the ravine and along the contour path where we passed the long run group running in the opposite direction with a very disgruntled Tim acting as sweep to some very slow runners who had joined in. 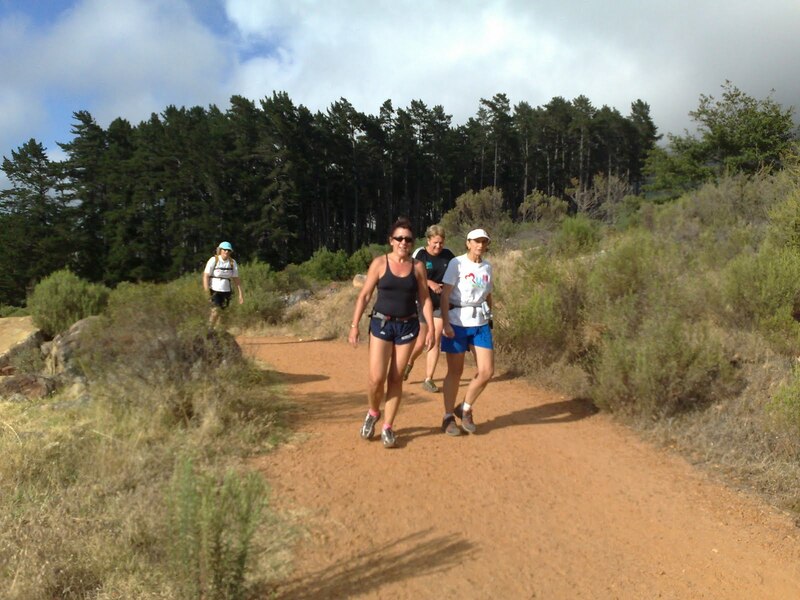 Passed the Block house and then diverted down to Tafelberg Road to make running a little easier for Elaine. Altogether we covered 12.25 km taking 2hrs 42 mins. Somewhat longer than planned but hay this is trail running and time and distance are at best estimates taken from Google Earth. PS. We discovered that the best way to find your way in the mist - look for the sign posts! It does help having someone you can actually see the signs! 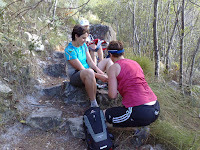 Overheard on the trail: You can't strap an ankle with duct tape - it chafes. Followed by: How do you even know that?